Happy Thanksgiving! I only have Thursday off this year, but I had a great morning talking to my mom and pin basting this first small quilt. I did a little hand stitching around the hexagon. I tried tying some of it, but it didn’t seem right. 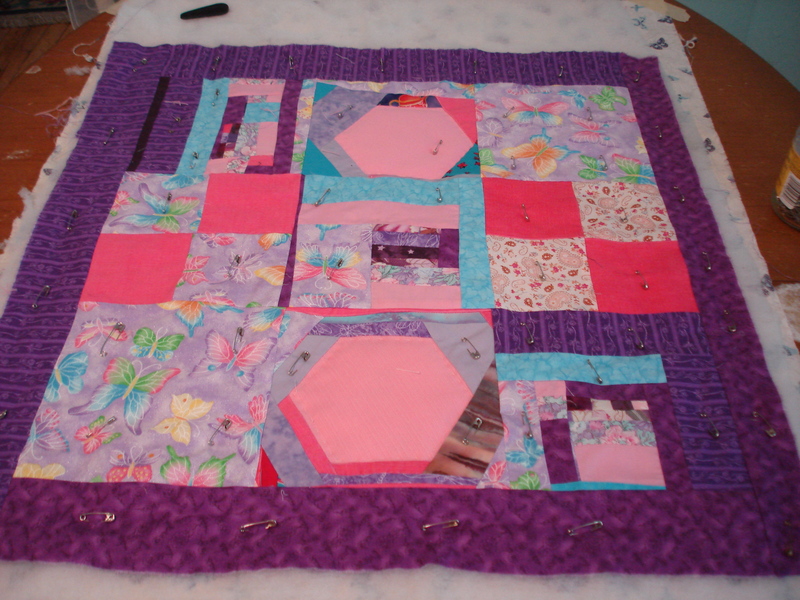 I will have to spend some time looking at it before I quilt it. I have no ideas yet. I hope you are having as lovely of a Thanksgiving. Since my husband always cooks, I pretty much just have to pick up a little. He’s one of the things I am thankful for! It’s hard not to feel blessed this year: All my family is healthy and safe, from my parents down to my littlest nephew. Two boys that are doing great in school. A solid roof and a new (to us) car. A new job that is still less stressful and more fun. Take care and have a turkeyful day!